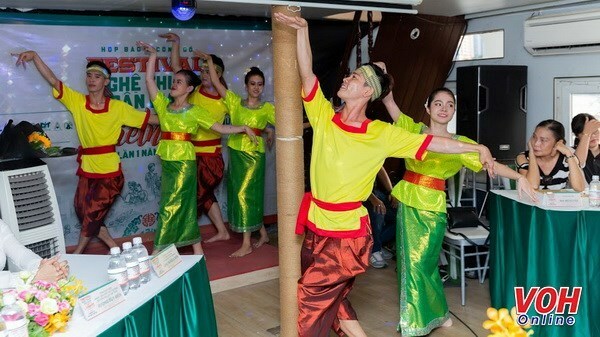 A Vietnamese folk culture festival will be held on April 13-15 in Ho Chi Minh City to serve local people and visitors during the Hung Kings holiday. The festival will take place at the city’s Nguyen Hue pedestrian zone in District 1. It will feature various forms of folk art performances from across the nation such as “xoe” dance in the north, “bai choi” singing and gong dance in the central region and “don ca tai tu” art form (southern amateur singing) in the south. In addition, visitors can join outdoor activities at the event’s recreation zones. Former Deputy Minister of Culture, Sports and Culture Vuong Duy Bien, the festival director, said the event aims to turn the Nguyen Hue pedestrian zone into a space for folk artists to perform and meet with the city’s residents and tourists and introducing Vietnamese folk culture to them. Legend has it that the Hung Kings ruled Vietnam from 2879 BC until 258 BC and they are considered the founders of the nation. To honour the Kings, the 10th day of the third lunar month is designated as their national commemorative anniversary date.